Soup Kitchen of Muncie, formerly Harvest Soup Kitchen, came to Farmhouse Creative expressing a desire for a complete rebrand. 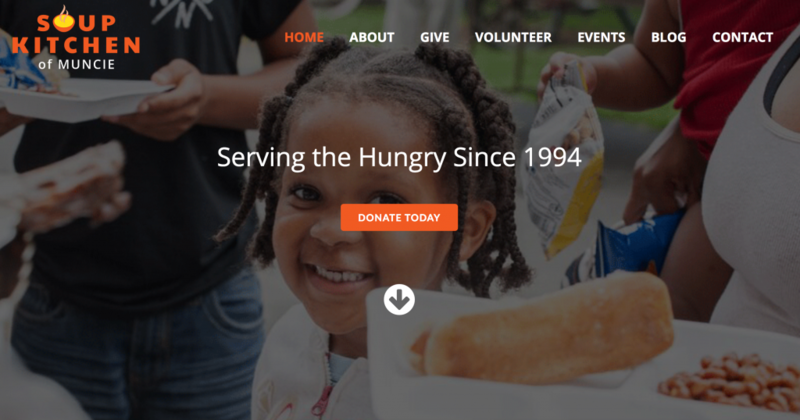 They realized that they were continually being confused with an East Central Indiana non-profit organization that also specializes in food distribution. In fact, sizable donations were being misappropriated to the other organization. Although Harvest Soup Kitchen had been a household name in Muncie since the late 1980s, we knew that it was important to rename the organization to distinguish it from other providers. Our strategy was to simply and clearly express two things: what the organization does and where they do it. Ultimately, Soup Kitchen of Muncie accomplished both of these objectives. With the new name agreed upon, we were ready to move forward with a brand refresh. We decided to move completely away from their original logo, which was too busy and very dated. Instead, we created a clean, two color logo that is distinct to their industry, not over-designed, and clearly illustrates their mission. It’s also flexible enough to use in various applications. The new name and logo got a great reception from Soup Kitchen’s board of directors and was unveiled at their annual campaign fundraiser in March of 2017. After the launch, we moved forward to create stationery items, direct mail pieces, promotional products, signage and retractable banners. We also built a new, easy to navigate website. Soup Kitchen of Muncie’s rebrand is proving to be a great success for their organization. Farmhouse Creative is proud to have had the opportunity to help! Ready to talk to the Farmhouse?